PRINCETON, NJ -- President Barack Obama's job approval rating on handling foreign affairs remains low, at 42%, although no lower than it was in June or August of this year. Thirty-one percent of Americans approve of Obama's handling of the situation in Syria, the first time Gallup has measured the president's approval rating on this issue. Obama's handling of foreign affairs is particularly relevant at this juncture, given the focus in Congress and the news media on the president's proposed plan to initiate military action in Syria in response to that country's alleged use of chemical weapons. Gallup polling last week showed that Americans oppose military action in that country by a 15-percentage-point margin, and Obama's low rating on handling Syria no doubt reflects the public's disagreement with his stance on the necessity for such military action. But Obama's controversial position on the situation in Syria has not, in the short term, affected his public standing on his handling of foreign affairs. His approval on this dimension has been stable since June, although it remains below his overall job approval rating (45%) in the same poll. 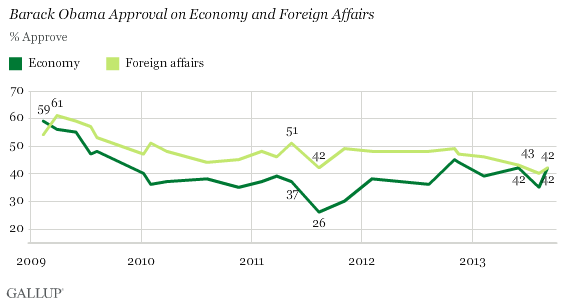 Obama's approval rating on foreign affairs has fluctuated over his time in office, ranging from a high of 61% just after he took office, in March 2009, to the low of 40% last month. Obama's approval rating on handling the economy, at 42%, is up slightly from 35% in August and the same as his June rating. His rating on this issue has been at least marginally higher in recent measures compared with the low point of 26% recorded in August 2011, and is above his approval rating on the economy from January 2010 to August 2012. Americans' views of the president on a number of character dimensions also appear largely unaffected by the situation in Syria. Between 53% and 56% of Americans say the president "displays good judgment in a crisis," "understands the problems Americans face in their daily lives," "is honest and trustworthy," and "is a strong and decisive leader." Meanwhile, 47% say Obama "can manage the government effectively" and 38% say he "has a clear plan for solving the country's problems." From a longer-term perspective, Obama's image on the leadership dimension has dropped by 20 points since April of his first year in office, but there has been little change since 2011. 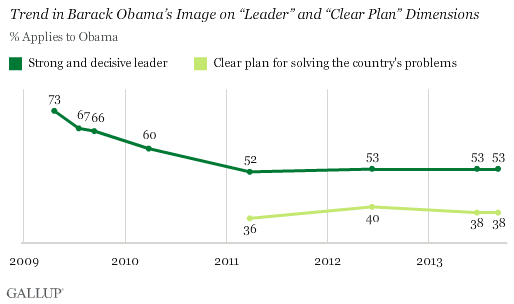 His image on having a clear plan for solving the nation's problems-- a dimension on which presidents usually score lower -- has likewise been quite steady since 2011. 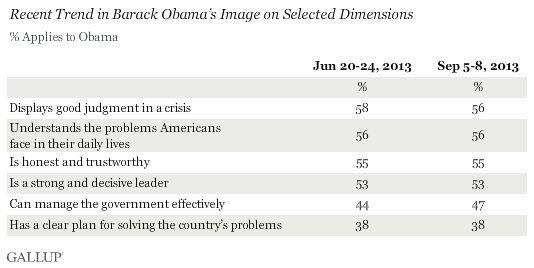 Gallup has asked Americans about Obama's displaying "good judgment in a crisis" only twice -- in the current survey and in June of this year, and the two readings are virtually identical. President Obama's current high-profile and controversial proposal for U.S. involvement in Syria has -- so far -- had little effect on his image in Americans' eyes. Although he has a low approval rating for handling the Syrian situation in particular, his rating on handling foreign affairs has not moved since June. Additionally, the public's perceptions of him on a series of key characteristics relating to leadership and government management have not changed in recent months. Obama's job approval rating in Gallup Daily tracking is, however, currently 43%, down slightly from averages in the mid-40s in August, and slightly lower than his 45% overall approval rating in the Sept. 5-8 survey. Americans who oppose U.S. military action in Syria say they do so because the conflict is not the country's business, is not well thought out or won't work, and would have negative consequences for the U.S.